Connections: A thrift store treasure! Several years ago I was prowling a thrift store and found this wreath. I bought it on impulse, not sure what I would do with it. As I was working at the Denver Zoo at the time, the idea of a wreath "full of animals" appealed to me. Then I noticed that most of the recognized major holidays of the USA are also represented as well. The first year we hung it during Christmas but since then it has become a year-round wreath. I'm not sure what the metal is. It has a brassy color but is too light in weight to be brass. During the holidays it enjoys a more prominent place then afterwards returns to its normal place on the wall--where it is in this photo. Actually I TOO have this exact wreath. I took it to Antiques Road Show a few years back. Here's what I found out. It's Dresden. From what they could sumize, Dresden was famous for their small metal ornaments. Someone took the "leftover" ornaments after the Christmas season one year, and make a few of these wreaths. Each "piece" individually is worth anywhere from 50-75 dollars each...so what WE have is priceless. 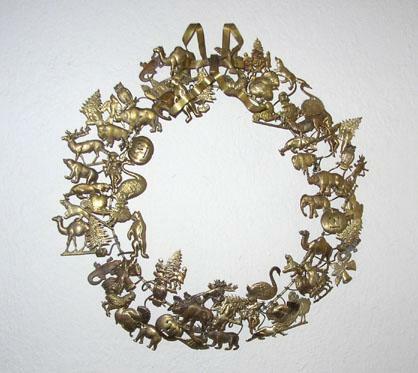 I used to sell these metal wreaths at my gift shop, they were called a "Wreath of All Seasons", I order then from (Vincent Lippie) showroom in the Chicago Merchandise Mart. I own several, the animals, music, good luck, in different sizes. They were not cheap even wholesale in the 70's and 80's. I have always loved them and still do, my wish now is I could find some more. I have never taken them down off the wall they are perfect. I have both small and large and loved them both. Do you still have this holiday wreath? I have been looking for one. Do you know what it is called? That is called an all season wreath and yours is one of only 4-5 known. But let's assume that really means 40-50 and the ones i know about mostly are in the New England area, or originated from there. Makes sense. It is brass, and the tabs behind the ornaments are there to tuck whatever season's greenery is in. We do metal restoration and I have one, which was a gift from my husband. I saw its larger replica today -- I have a smaller version. They really are rare. Here's why. The maker/designer was an immigrant, and I think from Germany in the late 1800s. He was a tool and die maker and this was his hobby. He made ornaments as gifts as a tradition, and very few wreaths. There is a company -- a small one -- in Arizona -- that has a few molds and recasts these as Victorian reproduction Christmas ornaments. They are good but they aren't all that close and I think they only have a few molds. I have the maker's name somewhere. Email me if you'd like it. Oopsie on my link. Fixed now. Thrift stores rock. What a great find!